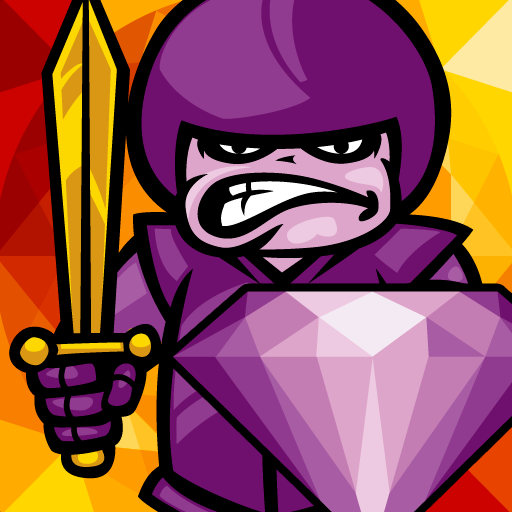 Our newest game is Pawn'd (for iPhone, iPad, and iPod touch). 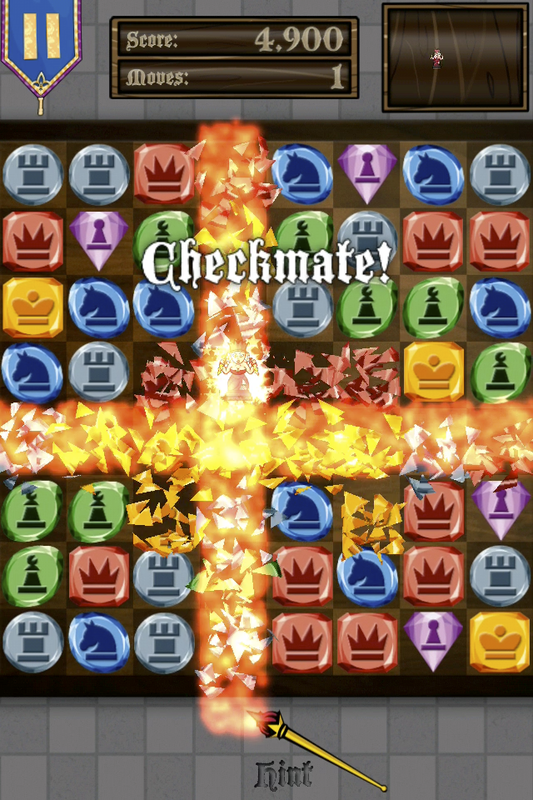 I was talking to my wife about trying to come up with ideas for games, interesting mash-ups of two unique games and said something like "Like mixing Bejeweled with Chess. Hey, that's a pretty good idea." Shawn is the one that came up with the Pawn'd name, we all jumped on that immediately. As we were making the game, I'd do screenshots to send to show off graphics and things that Peter was making. It shows a nice evolution of the art. The hardest part was getting the gem tiles just right. There's a lot more steps, not everything got a screenshot, but still nice to show the progression. We started with it a very chess looking game, but that was way too hard to see what pieces were which. This was early, before going to just one color. The thinking was also that you could match 3 of the background gem (like purple pawns), and get a bonus if they were all 3 white or black. But that made the board way too busy. Closer, more gem like, we still had it more like a chess game with pieces in different directions...I think we still had the thought here that it would do a bonus if all 3 matched were the same direction. We pretty quickly ditched the idea of bonuses for the same direction or all black/white. Even good pieces but reversed was too busy. We even contacted the person who had drawn them (they were available on iStockphoto) Ryan Burke at www.BurkeVector.com and purchased so he would remove them so nobody else can buy them now :) I think that was a very good investment. Shawn drew many of the other graphics, and Pete did lots of piecing together things from Shawn and iStockphoto along with original Photoshop creations. They did a great job matching up the styles...something you'll see more of in some planned updates. The first version that's quite similar to what ended up in the game. The gem background shapes and colors here are what we used. This set is very good, a version of it may come back as an unlockable set you can use in the game! But we still love the characters too, so tried other ways to get them to work. I think in the end we did, but that'll be as an unlockable set in an update as well! Much better, and some of the other graphics coming in too--these are very close to the final backgrounds for the game, just offset and positioned a little differently in the final game. And the final version as submitted for version 1.0. 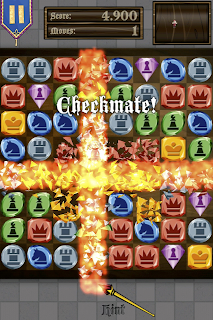 A little more vibrant chess piece icons on the gem tiles (and the bishop one got the little slice out of it.) And everything else polished up. Spent a snowy Sunday making a waving banner thing, so the little pause button in the corner and other menus can do a subtle waving flag effect. Shows how all our bits work together too, Shawn drew the background wood textures for the scoreboard, and Peter made that into layers and overlay shapes so I could put it all up on the screen. We DID put the characters to good use, they're used as "Poison'd" pieces in the game for one of the game types, and the pawn is used as the icon for the App. You add some particle fire on top of the shattering-glass effect I created and it all looks pretty sweet!